I knew that I wanted to do research in DC for my senior thesis so that I could learn more about where I’ve lived for four years and so that doing field research would be more feasable. At first, I wasn’t sure what to learn about. But then I remembered a short article that I read while studying abroad about how the place where I was staying was physically segregated by the transportation system of the town. As I read, I recall thinking about how similar this sounded to Washington, DC. So I decided to explore transit in DC with the same critical eye as the author of the article. 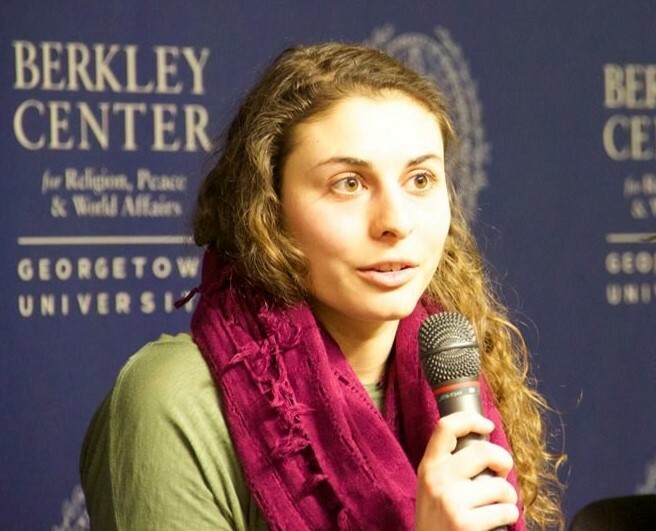 I had the opportunity to do research first as an Education and Social Justice Fellow with the Berkley Center for Religion, Peace and World Affairs and the Center for Social Justice. For this specific project, I am required to do a senior thesis project for my major, Justice and Peace Studies. I’m glad to have the opportunity, though, because I would like to continue doing research! I love collecting qualitative data by speaking with people. I think it is really cool to meet new people and learn from them, and I think it makes people happy to know that what they think is valuable to what I am writing. It’s particularly fun because often someone will say something in an interview that gives me a good idea right then and there. It’s not the same kind of “brain blast” I can get from reading a book, because the person with all the information about what they think is right in front of me. I can ask more questions to clarify and sometimes the interview turns into a more casual but incredibly interesting conversation. That’s when it is the most fun, and I often walk out feeling like I have made a new friend and learned something new. Recently, the most challenging part has been finding subjects. With interviews, it’s pretty easy, because you set an appointment with an individual; if they don’t show up they will clearly be missed. But focus groups are different. I just held a focus group where I spoke to all the participants over the phone, and called them a second time the day before the focus group to confirm that they could make it. Even then, only one person showed up. The amount of information there is about my topic that won’t even make it into my final paper is definitely unexpected! For example, although I am researching transit and social cohesion, a lot of my argument relies on substantive knowledge of gentrification. Even though it is only a small piece, I read extensively into the literature, and I’m going to have to cut lots of things about gentrification out of my first draft. Since my project is a senior thesis, I have had lots of support in this process. All of the Justice and Peace majors in my class took a seminar last semester to help us get our feet on the ground. Now each of us has an individual thesis mentor who we meet with regularly; mine is Dr. Andria Wisler, and I could not have asked for a better mentor. The librarians in Lau are also amazingly helpful, as anyone at Georgetown who has done research should know. The cool thing about my research project is that it overlaps with urban planning, for which there is a Master’s program in Georgetown’s School of Continuing Studies (SCS). That means that I have been able to go to the SCS campus downtown for a few lectures and to meet with the urban planning faculty and the librarian in the SCS library. Even though I’m an undergrad from Main Campus, they have been very supportive of me there as well. Through interviews and focus groups, I am testing what potential the DC Streetcar, as a form of transit that crosses gentrified areas and invisible borders between people of different races and classes of Washington, DC, has to foster social cohesion between Georgetown and Benning as it puts riders in contact with residents from neighborhoods, possibly forcing them to face new realities, break down prejudices, and increase empathy. Think about things that are taken for granted in the world around you and question them. If you make that the starting point for your research, you are bound to immerse yourself in a topic worth exploring. And don’t be afraid to talk to others about what you are learning! Even if they are not “experts,” they will likely ask questions you have not thought of yet.